The Last Post with Andrew Carey is brought to you by Finucane’s Electrical, Limerick’s electrical superstore. 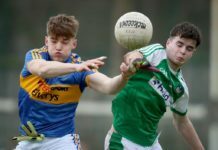 Andrew Carey is joined by Limerick Post editor, Gerry Collison to discuss some of this week’s news stories, and Sports Editor, John Keogh, chats to Andrew about this week’s sports news. Andrew is then joined by Eric Fitzgerald and Rose Rushe, editors of the Post’s Entertainment and Arts section respectively to discuss what’s going on in Limerick.